This is why you are here and few areas offer more variety for every standard of skier or boarder. The Three Valleys ski area joins the Meribel, Courchevel and Val Thorens valleys with Meribel at the very heart. Meribel has amazing skiing in its own right, but combined with its neighbours Courchevel and Val Thorens, you really are spoilt for choice. The slopes are well matched for all levels of skiers with 17% green runs, 39% blue runs, 33% red runs and 11% black. Whether you are a complete beginner wanting to build your confidence on easy green and blue runs or an expert seeking the steepest couloir, Meribel won't disappoint. With 85% of the Three Valleys slopes above 1,800 metres which in addition to expansive snow making systems ensures a long season running from 9th December 2017 until 22nd April 2018. The lift system is modern and efficient, minimising waiting time and maximising ski time. For those who are new to the ski area, we recommend that you speak with our experienced team, who will be happy to advise you on the most suitable slopes to suit your ability. They’ll also be able to give you the inside scoop on where to avoid the crowds, fantastic places to stop for lunch and the best spots to relax and enjoy the views. 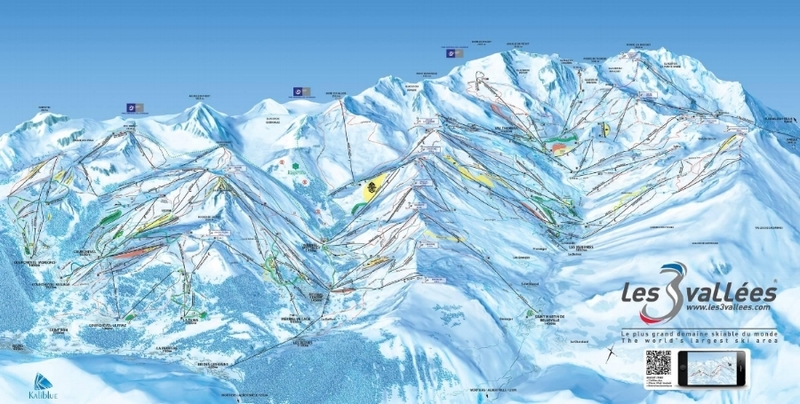 321Ski runs: 32 Black Runs, 106 Red Runs, 132 Blue Runs and 51 Green. Whatever the weather, and whatever level of skier you are, when you’ve got a playground of 600km of groomed slopes to shred you’ll always find something to fill your (ski) boots. Here's our guide to some of our favourite places to ski in the 3 Valleys. From your start point of La Chaudanne, you can choose to head in 5 different directions. We love cruising the blues down to Courchevel from the top of Saulire, the fast long drops from the top of Mont Vallon. Or if you get an early start making the journey to the top of Val Thorens - don't forget to grab a quick drink at La Folie Douce. For ideal family skiing, Courchevel is as perfect as it comes. Acres of greens and blues, plus the Family Park in 1850 is beautifully shaped so everyone can try the kickers, table tops and boarder cross. If you like your runs with even more room to manoeuvre, Courchevel 1650 beats the crowds plus the kids will love stopping in the Indian Village for a spot of face painting (yes, big kids like you can also get inked). From Meribel take the Saulire Express, pop over the top onto Creux (our No1 favourite run), catch your breath on the Roc Mugnier chair and then pick any of the many runs around Signal and Chaplets. It helps that the restaurants and cafes in this area are significantly cheaper than 1850, if not quite as ritzy. A cloudy or white out day? No worries. Stick on your low light lenses and nip over the valley into the tree-lined runs leading down to La Tania. Folyeres is a firm TG Ski favourite, where, on a bad weather day, you’ll find us happily cruising down this long curvy blue over and over (that’s when we’re not loving the motorway green Plan Fontaine or, in warmer weather when it’s not too icy, the red Moreta Blanche). It helps that the Ski Lodge in La Tania village offers great value lunches and dead cheap beer. During school holidays when the pistes are bustling, our top tip is to stick close to home. Head out first thing, avoid the Saulire Express, and hop on the Roc de Fer and Olympic chairs then hoon down Face. Back in Meribel’s Chaudanne, take the Plan De L’Homme and make your way to Faon (a great blue), Blaireau (a steep red) or, if you like bumps, Ecureuil (black). These are also a great start to a powder day when everyone is rushing to get further afield. Make sure you’re on the first lifts, carve up the fresh pow and then when you’ve had your fill nip over to the next valley Saint Martin de Belleville and point your skis towards Jerusalem one of the longest reds in the 3Vs. There are some brilliantly fun, easy access off piste powder fields in this area too - ideal for first time forays or expert carving.